6 Social Security Basics Everyone Should Know. 6 Easy-To-Understand Social Security Basics Everyone Should Know. We’ve all heard that Social Security is really complicated. In many cases, it is! However, I’ve found that 80% of the questions are answered with one of the six Social Security basics that everyone should know. For the past three years, studying Social Security has replaced most of my hobbies. I’ve never considered myself overly academic, but I’ve really enjoyed this pursuit. But just when I think I have a firm grasp on the program, I learn a new rule that blows my mind. This shouldn’t surprise me though. The Social Security Administration has nearly 3,000 rules and a 108,000 page website to filter through when seeking information. When I first started, this massive website and rule book felt like drinking from a fire hose. It was just too much information. But after spending the last three years studying, speaking and writing on Social Security, I’ve learned that most questions can be answered within one of the six Social Security basics. For those born between 1943 and 1954, the full retirement age is 66 years old. If you were born between 1955 and 1960 your full retirement age will be age 66 plus 2 months for every year after 1954. Born in 1961 or later? Your full retirement age is 67. Why are all those numbers important? Your full retirement age is when you are entitled to 100% of your “primary insurance amount” or better known as your full retirement age benefit. If you file then, you will receive a benefit based on your earning history only. If you file earlier, it will be reduced. If you file later, it will be increased. Want to file early and keep working? Not so fast! There are limits to the amount you can earn if you file for early benefits. If you have been married before, it is crucial to know your length of marriage rules. The benefit that has the shortest length of marriage requirement is the survivor benefit. 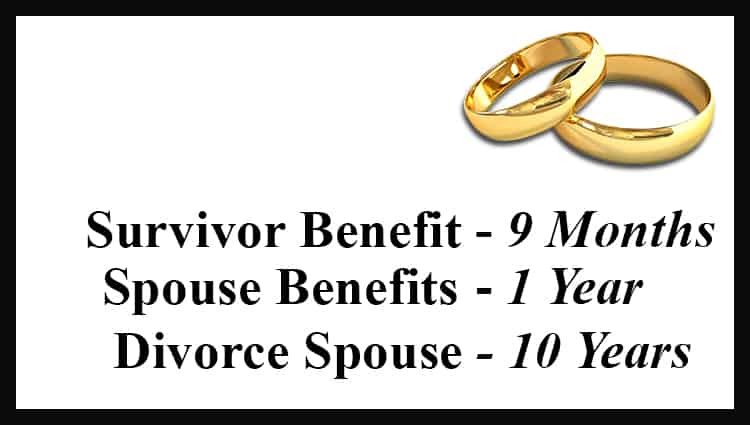 For survivor benefits the marriage must have lasted 9 months or longer. There are a few reasons that this rule is waived for surviving spouses. As a broad overview it could be waived if: (a) You are the natural or adoptive parent of the deceased worker’s biological child or (b) if the death was a result of accident. Spousal benefits are easy. The marriage must have lasted for one continuous year. The length of marriage requirement for divorced spouses is 10 years. However, the “divorced spouse” category is a little unique in that it is not a category on its own. As a divorced spouse you could be entitled to either Survivor benefits or Spousal benefits. This depends first on (a) did you meet the 10 year requirement (b) whether or not your ex-spouse is still alive & (c) your eligibility for benefits due to your current marital status. Be warned, if you remarry prior to age 60, you lose the right to claim on an ex-spouse’s record — at least until the subsequent marriage(s) end in death or divorce. If you remarry after age 60, you are eligible to receive benefits based on the highest of your benefit, your current spouse’s benefit, or your deceased spouse’s survivor benefit. So what about multiple marriages? As long as all marriages have ended, and you’ve met the length of marriage rules, you can choose the highest benefit from any of your ex-spouses. 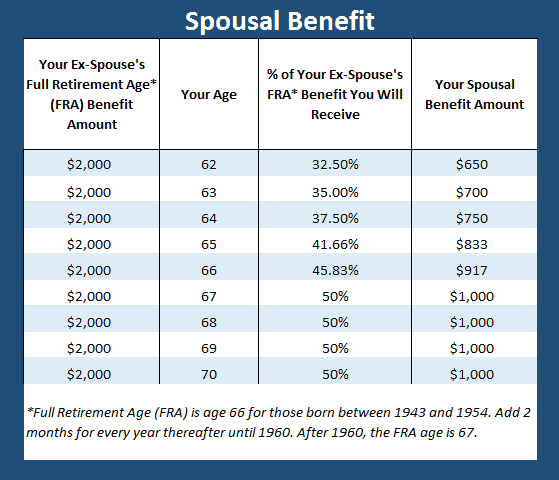 A spousal benefit is based on the benefit amount of a spouse. Typically, this is the higher earning spouse. Although it’s adjusted for filing age, the benefit at Full Retirement Age is 50% of the higher earning spouse’s benefit. Be aware! The reductions are steeper for a spousal benefit than they are if you are filing for your own benefit. For an example, let’s make the assumption that the higher earning spouse has a full retirement age benefit of $2,000. We’ll also have to assume that both spouses will reach full retirement age at 66. You’ll see in the chart that the penalty for filing early is sharp. Survivor benefits are benefits that are payable to a spouse of a deceased worker. This could also be an ex-spouse if the length of marriage rules have been met. Generally, the surviving spouse is paid the greater of his/her own benefit or the benefit of the deceased; whichever is highest. The lowest benefit drops off. If the surviving spouse is not full retirement age, the survivor’s benefit may be reduced for their filing age. The credits and reductions are easy when you are only working with the benefit from your work record. If you file earlier than your full retirement age, your benefit will be reduced. If you file later, it will be increased. On the other side, if you file early, your full retirement age benefit will be reduced. How much it’s reduced all depends on your age when you file. If you file at 65-one year early-your benefit will be reduced by almost 7%. Those reductions continue to age 62. At this point your benefit would be at least 25% lower than what you would receive at your full retirement age. That’s a nice simplistic view of reductions for filing early and credit for filing later, but what about if you plan to file at 67 years and 8 months? How do the credits – or reductions – break down on a monthly basis? There are three separate calculation bands used to determine how much your benefit will increase or decrease on a monthly basis. This calculation can be used no matter what your full retirement age may be. 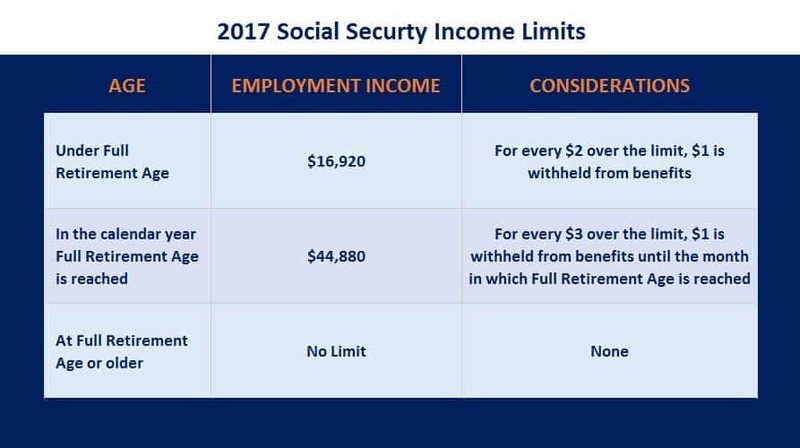 With a good understanding of these basics, you’ll be much better prepared to make an informed Social Security decision.